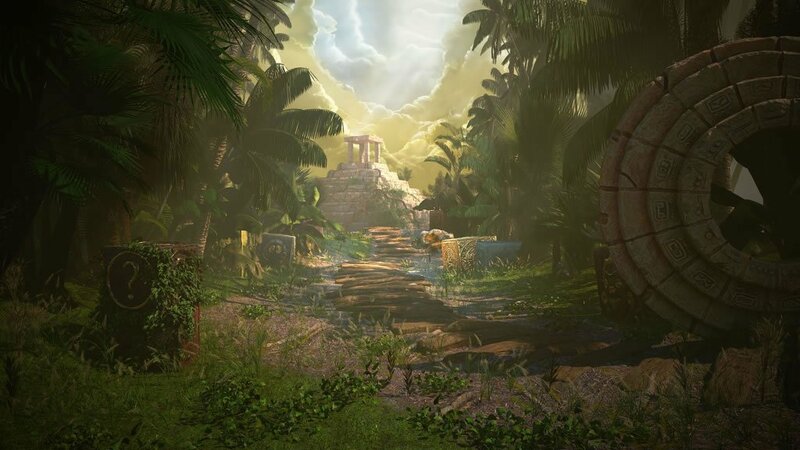 Gonzo’s Quest – The Search for Eldorado, takes you on a slots adventure to find the ancient and mystical lost city of gold, Eldorado. 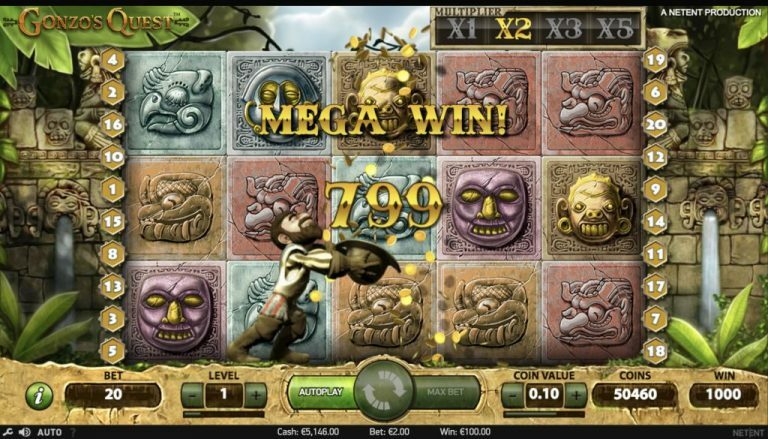 This unique slot from NetEnt kicks-off with a short intro video with Gonzo grabbing his treasure map, jumping off his ship and venturing into the jungle. Gonzo’s Quest boasts some interesting and unique features, that give this slot an edge and has made this one of the most popular NetEnt video slots. As Gonzo enters the main playing screen, you immediately notice that this slot is a little different, despite the familiar 5-reel, 3 row layout. The backdrop is filled with Aztec inspired images and the playing symbols do not resemble anything you’ve seen in other slot games. The imagery is excellent, and it’s clear that NetEnt invested time in adding extra details to give this slot its unique appearance. As with all NetEnt slots, the animation is clean and precise. The soundtrack is a little monotonous, with its jungle background sounds and the sound effects when the symbols fall into place and the winning combination sound is nothing to be desired, but it suits the game. The first unique characteristic of this slot is that the reels behave more like a Tetris game than rolling reels. Each symbol that appears on a carved block of stone, falls from above into its place. But this is where things really change, with the Avalanche feature. Once the blocks fall into position, if there are any winning combinations, these are highlighted and the blocks that made up the combination crumble and explode making room for new blocks to fall into their place and possibly form more winning combinations. The Avalanche process continues till there are no more winning combinations and the round then ends. But, there is even more to this. Located on the top right of the screen is the ‘multiplier meter’ with X1, X2, X3, X5 on it. Each time the Avalanche takes place within a single round, the multiplier is applied to each win, starting at X1 for the first win, X2 for the second win, etc. and increases systematically with every winning combination within that round up to X5. Once there are no more winning combinations, the multiplier meter drops back down to X1. While the concept of the exploding blocks and the Avalanche are great and add some nail-biting excitement as you hope for even more wins, it does slow down game play as you have to wait for the animation and process to complete. As mentioned earlier, there are no familiar symbols; no bars, cherries or 7’s. Gonzo’s Quest has its own seven main symbols, all with Aztec inspired images on them. The top paying silver and gold smiling face pays out a healthy 2,500 for five symbols on a payline. There are an additional two special symbols that sport unique features. The first is the golden, Free Fall symbol, which triggers the ‘free spins.’ The other symbol to look out for is the grey tile with a golden question mark on it, which is wild and can substitute for all other symbols. Gonzo’s Quest doesn’t have a dedicated bonus feature round, similar to other slots, but instead, it employs the Avalanche feature as described above. In one sense, it would have been great to include a bonus feature, but often with bonus features, you don’t get to experience them very often, which can be disappointing. On the other hand, the Avalanche feature tends to occur more regularly, but you don’t often go higher than the X2 multiplier. Either way, Gonzo’s Quest is still good fun to play. Gonzo’s Quest does have a ‘free spins’ feature, although, because of the nature of the falling blocks, they aptly call it ‘Free Falls’. The Free Falls feature is triggered when 3 Free Fall symbols appear in succession on a payline, starting from the leftmost reel. You will be awarded with 10 Free Falls and additional Free Falls can be won during the round. You can really rack up some massive wins during the Free Falls, because each winning combination gets an Avalanche multiplier applied to it. Instead of the regular game play multiplier as mentioned earlier of X1, X2, X3, X5, you will be rewarded with X3, X6, X9, X15 for each successive win. Gonzo’s Quest does not have a dedicated jackpot, nor is it linked to any progressive jackpot. Gonzo’s Quest has 20 fixed paylines, 3 rows and 5-reels. Being fixed paylines, you cannot change the number of lines you wish to bet on, but you can adjust the coin value and the payline stake amount by adjusting the level. Gonzo’s Quest has a 96% RTP, around the usual level of return to player you would expect from most NetEnt slots. The volatility of Gonzo’s Quest is medium, so don’t be expecting substantial wins on every spin. Your big wins will come from the Free Falls due to the combined Avalanche effect and the higher Free Fall multipliers. Gonzo’s Quest – The Search for Eldorado is an excellent slot with a lot of entertainment value and the potential for some great wins. The Avalanche and Free Falls features give this slot a pleasant uniqueness and will keep you playing for hours. If you prefer fast paced slots where you don’t need to wait for animations or can skip them, then this might not be the slot for you, but it’s still worth giving it a try. Gonzo’s Quest is a firm favorite amongst slots players and has been for some years now.